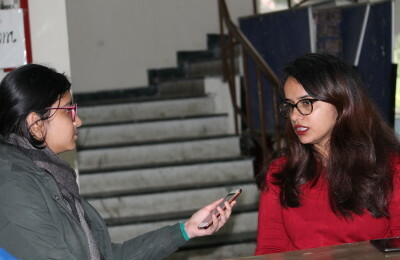 As Natuve, The Theatre Society of Shaheed Bhagat Singh College comes up with its annual street play fest, Paigaam ’19, the showstopper to the University fest season, our correspondent traces their success journey through the fabled hippodromes of the capital this far. A typical day at Safdar Hashmi Theater. Delhi’s play going coterie, an endangered species, the entire crowd, standing on their feet, clapping, like a part of them knew that they hadn’t seen anything of this warmth for a time. A mere college theatre society, Natuve’s original production Mx. Mute had just got over. There are many words which come to mind when one tracks the progress of this theatre society over the last four years. If you happened to take a walk down the left wing of Shaheed Bhagat Singh College, any day of the year, the weather bleak or rosy, the sun on your shoulders or shying away from your eyes, you can count on finding the kids from Natuve, drifting in their black kurtas. Right from the soul scorching heat of the Delhi summer to the glorious winters, the society works to bring out the best in themselves, and magically makes their very own amateur effort, with a world of experiments, imperfections, and innocence, rise and shine. Natuve came up with two plays this year. Mx. Mute and Vyavsaaya Me Tarakki Paane Ke Chamatkaari Totke. While the formeer gave a subtle spin to the issue of assimilation of the LGBTQIA+ identity in the society, standing out particularly for the phenomenal work of the chorus to showcase genders, characters and societal reactions, Vyavsaaya, on the other hand was a hilarious musical comedy, keeping the audience at the edge of the seat at all times, not missing to prickle, however, with its sharp, nuanced satire. The plays had many an innocent flaws. A few hiccups in transition, a tad too overexcited lightwork, a few rookie mistake in the sounds, and a few mis-directed laughs, yes. Nevertheless, what stood out was the hard work of every last person, what won hearts was their sisyphean desire to make their play the best it could be. The constant fire to give as much life to the art as possible. This won them awards, yes, the most in the college circuit this year, but more importantly, they continued the meteoric rise of Natuve. Yes, that’s the word we were looking for. Natuve continues to be a beloved. Join them at their fest tomorrow. With Natuve, you have my word, the sun would be a bit kinder to you.